[From IMDB:] After a teenager has a terrifying vision of him and his friends dying in a plane crash, he prevents the accident only to have Death hunt them down, one by one. Y’know, it’s funny: as a teen it never actually occurred to me that Final Destination dealt with issues of survivor’s guilt and PTSD. Those are some pretty heavy themes for a teen horror movie, which I suppose is reflected in the occasionally clumsy way that it handles them. Still, I found myself having to reevaluate my rather low opinion of this movie, which was probably developed on the backs of the franchise that Final Destination would go on to become. It’s not actually that bad, even if it falters whenever it tries to be a bit too mature for its own good. Not only does Final Destination bring us its trademark of elaborate deaths, but there are actually some funny moments in the script, too. And it strides that balance between existential angst and witticisms with admirable grace, for a movie based on the premise that all of its cast members are probably (hopefully?) going to die in a dramatic fashion. I also found myself appreciating the fact that Devon Sawa, who played the lead character Alex (and who, incidentally, got kinda hot), actually looked like a teenager, even if that then meant that some of his castmates looked a little aged in comparison. And how can you not love any film that brings the Candyman back to the big screen? 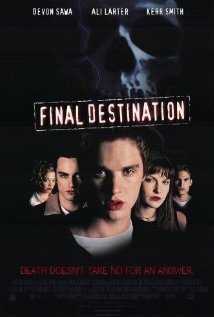 So, with all of that in mind, it’s with a mild sense of surprise that I actually find myself wanting to give the original Final Destination movie a nod of appreciation. It knows exactly what it’s about and aims to deliver exactly that, which makes for an entertaining hour and a half of movie watching. I can’t complain about that. P.S. So…do you think that Death suffers from OCD, or is it just really petty?